Vanholio: Are the Pasties All That's Fresh!? Haha! Fooled ya! No, this is a sign for a roadside place selling Cornish pasties (PAAS-teez). Saw it yesterday in Michigan's Upper Peninsula. Pasties are a meal in a turnover originating in Cornwall, UK. The UP is big mining country, and shitloads of Cornish miners emigrated there a long time ago. Pasty love is their legacy. In Michigan, they usually fill pasties with chopped beef, potato, carrots, onion, and rutabaga. Kinda like a hash. If you don't want to eat it plain, they'll give you ketchup or gravy. 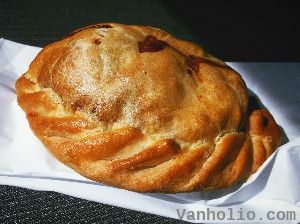 In Vanholio's experience, most cultures have something like a pasty, lunch you can carry in your pocket. The Latin Americans have empanadas. The Chinese have pork dumplings. The Indians and Pakis have samosas. I ate that pasty in the photo by the way. And that's why I'm a fatass.